Vintage Owl Charm Necklace only $1.17 w/ Free Shipping! 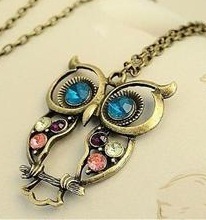 Head over to Amazon and get this vintage style colorful owl necklace for only $1.17 with free shipping! There's not much else to say about it, other than it has lots of great reviews and it comes with the necklace and charm.